Stop me if you have heard this one before. A group of citizens are unhappy with the government. A viral communications network is born, spreading words of dissent throughout the land. The authorities crack down with a vengeance. This may sound like the story of a Twitter or Facebook “revolution” in some repressive corner of the world. In fact, it is a tale of how illicit poetry spread through the streets of eighteenth-century Paris. Poetry and the Police begins in 1749, when politically controversial poems swept through Paris. A police lieutenant was sent out to nab the dissident author of an ode with the line, “Monstre dont la noire furie,”or “Monster whose black fury.” The monster in question was Louis XV, and referring to him in such terms was an act of lèse majesté. (A little less than two centuries later Osip Mandelstam wrote a similarly irreverent—and personally catastrophic—poem comparing Stalin’s mustache to the bristles of a cockroach.) Tracing the origins of the poem was no simple matter. The poem had crossed paths with several others, and each took its own route. The verses were copied on pieces of paper, dictated, memorized, or sung to the tune of popular songs. The police deployed a legion of spies to get to the bottom of the matter. They interrogated a medical student who had recited the poem, and he identified the individual who gave the poem to him. A string of arrests followed, ultimately filling the cells of the Bastille with fourteen individuals accused of taking part in unauthorized poetry recitals. (The incident is thus known as “The Affair of the Fourteen”.) The poem was apparently passed along by a relatively young group of students, clerks, and priests. The original author was never found. The poems reflected a wide range of grievances. The winter of 1748-1749 was not a happy time. 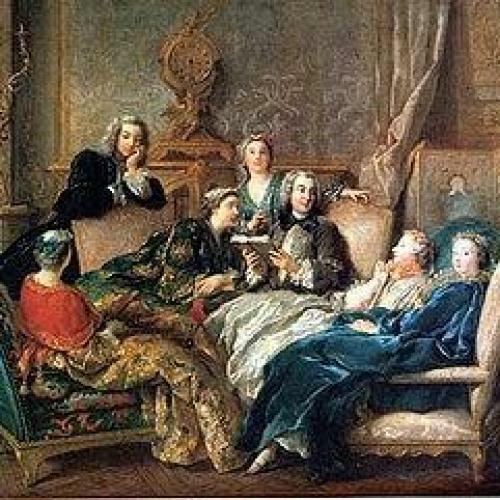 The French were reeling from the unsuccessful ending of the War of the Austrian Succession in 1748, and from the high taxes that Louis levied to finance the war. While the war had ended in a French victory, Louis “lost the peace” by agreeing to a treaty that, among other things, expelled the much-adored Prince Edouard from the country. Prince Edouard, more commonly known as Charles Edward Stuart or “Bonnie Prince Charlie,” was the grandson of the deposed King James II, England’s last Catholic monarch. After his attempt to claim the British throne failed in 1745, Stuart fled to France, where Louis granted him exile. This book can be read in two ways. Historians will likely delight in the details and the diagrams provided by Darnton, who tips his hat to the impressive record-keeping of the French police. But others will be more interested in larger questions about how communications networks spread ideas and information. As the Internet continues to pose challenges to authoritarian regimes around the world, and opportunities to dissidents, Darnton’s lively and erudite historical monograph offers valuable insights for our own time. The first lesson is that you do not need cutting-edge technology to spread the word. Things went “viral” even before the Internet, and in quantities large enough to rattle power. In the world that Darnton describes, even French-language gazettes of Holland were constrained by French government pressure. Still, the poems served as a kind of “sung newspaper” and “all of Paris was buzzing with news about public affairs.” This has an obvious parallel in today’s China, where news, jokes, and ideas explode online despite the authorities’ extensive efforts to control the flow of information. It can be difficult to track the precise paths or origins of the ideas that sprout up on Chinese Twitter. In fact, the old French dissidents may have had an advantage. It seems more difficult to track a song than a tweet, because the latter can leave a trail of online footprints that increasingly tech-savvy governments are eager to follow. How to follow a song? Of course, those nasty verses flitting about Paris did not seriously threaten the power of the state. So why did the police react so strongly? As Darnton observes, “The police often arrested Parisians who openly insulted the king. But in this case, they ran a dragnet through all the colleges and cafés of Paris, and when they pulled in an assortment of little abbés and law clerks, they crushed them with the full force of the king’s authority. Why?” The poems may have been angry, but “none of the Fourteen betrayed symptoms of a revolutionary mentality.” So wherein lay the threat? A common consciousness may not be enough to spark a revolution, but it is hard to imagine a revolution without one. Darnton makes it very clear that in 1749 France was not ready for drastic upheaval. But he leaves us to wonder if the poems, in some small way, laid the groundwork for the storming of the Bastille forty years later. Emily Parker is on the policy planning staff of the U.S. Department of State, where she covers innovation, technology, and twenty-first century statecraft. The views expressed are her own and do not necessarily represent the views of the U.S. Department of State or the U.S. Government.